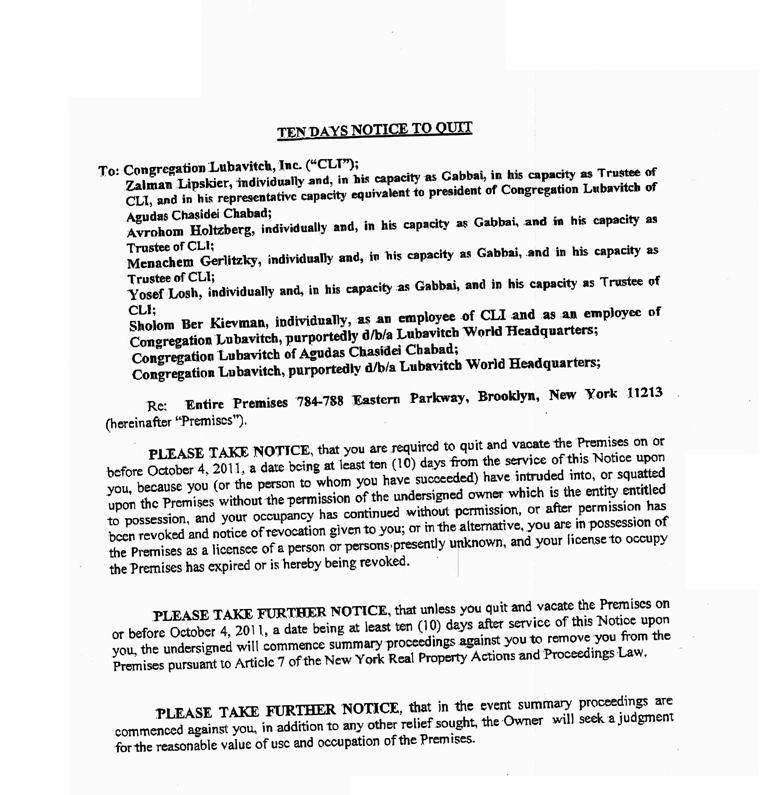 Good News: The Meshichist Mossrim Gaboim of Congregation Lubavitch – 770, received an eviction notice. 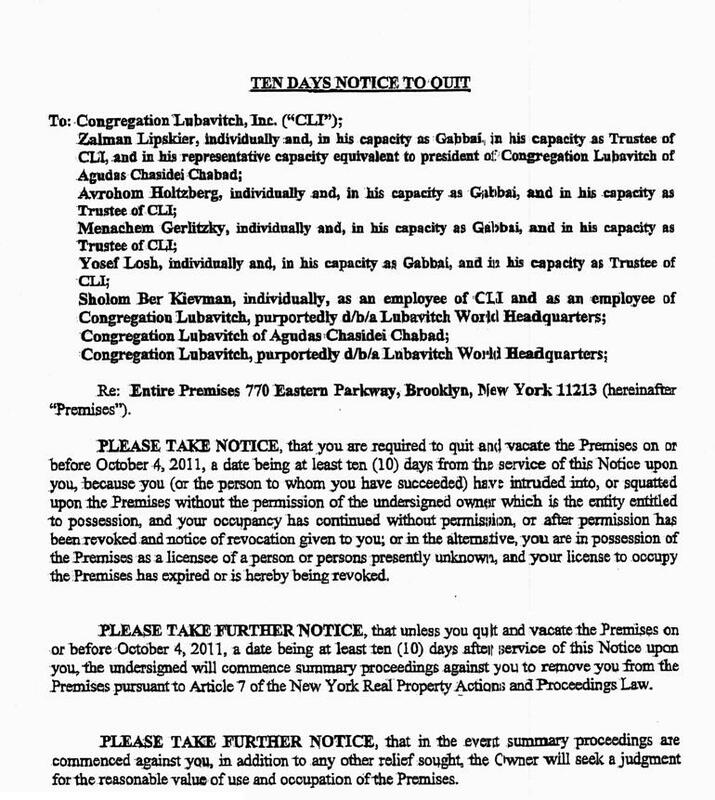 The notice was addressed to the Gaboim and to the corporation known as “Congregation Lubavitch”, and demanded they evacuate the premises withing 10 days. Otherwise they face yet another court case. The notice was signed by Rabbi Avraham Shemtov and Rabbi Yehuda Krinsky who represent Agudas Chassidei Chabad and Merkos L’inyonei Chinuch respectively. Let’s hope and pray that this finally comes to fruition. 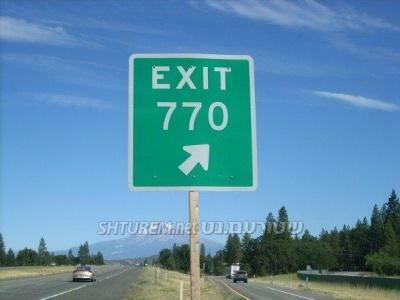 This entry was posted on September 24, 2011 at 11:24 pm and is filed under Good Stuff, Mishichistim Mossrim. You can follow any responses to this entry through the RSS 2.0 feed. You can leave a response, or trackback from your own site. Not all Meshichistim are Mossrim, but all Mossrim are Meshichistim! At a recent trip to Israel I had the opportunity to meet up with my extended family at a family Simcha (Uncles, Ants, Cousins and second cousins). We had all come to spend a Shabbos together to celebrate my niece’s Bat-Mitzva. It turns out I have a cousin who was “learning” in Tzfat “Yeshiva” (a.k.a the Mishichist Yeshiva). This year was his second year at this institution. He was aware that I was one of the Shomrim Six and related the following to me. He said that while we sat on trial, the Mishichist Bochrim were all excited, he said that for six weeks (the course of the trial), the Yeshiva was alive. Everyday the Bochrim would get an update as to the proceedings of that day in court. The discussions in the study hall, dining room and dorm rooms were all about the trial. I asked my cousin if this was just a few guys or the Yeshiva at large and to this the reply was the Yeshiva at large. I then asked how was the reaction after the not guilty verdict? “They were all down and depressed, they couldn’t look me in the eyes, and this was a big hit for them” my cousin said. I have a brother in-law who is in Tzfat “Yeshiva” as well. I wanted to confirm that the above was indeed true and so Motzi Shabbos when I returned to my in-laws I asked my brother in-law about how it was when we sat on trial, he said the same exact thing as my cousin, only they told him that “his brother in-law is going to jail”, his brother in-law was screwed”. The Shomrim Six Mesira was not a Mesira of a few Mishichistim, the whole Mishichist movement was involved, and they were all excited, praying that the Shomrim Six be found guilty and imprisoned for 15 plus years. When we came aware that we are actually going to go to trial, we did everything we possibly can to stop it. We reached out to Meshichitim “Mashpiyim”, Meshichistim Supporters (those doing money laundering business with Mendel Hendel), to no avail. We even offered one meshichist “Shliach” a brand new Safor Torah if he would get involed to stop the Mesira. The Meshichist “Shliach” not only refused to help, he justified Six Jews going to jail for 15 plus years. Six Jews he never met, six Jews with families and jobs, plain and and simple six Jews. They will all pay the price. Jewish blood is not cheap! Theres still a long process ahead. The Gaboyim/Meshichiat party/Mendel Hendel will surly fight this. Where does Mendel Hendel get the millions to pay for all this? Why do those people give for this “cause”, whats in it for them? Trust me when i say….770 is the least of the meshichist Mossrims problems. They should have been given the boot a long long time ago. What changed now that AS and YK are finally doing this? A powerful rabbi is acting like the Grinch who stole Yom Kippur — slapping the congregation of Lubavitch World Headquarters with an eviction notice right before the high holy days. Rabbi Yehuda Krinsky, leader of the Chabad Lubavitch movement, served the Brooklyn congregation’s board of governors with a notice giving them 10 days to clear out of 770 Eastern Parkway on Friday, hours before the Sabbath and less than a week before Rosh Hashanah, which begins tomorrow night. “For them to initiate a secular court action on the eve of the new year, to have the people vacate the premises, you’re talking about thousands of people coming from all over the world, to have them vacate the premise several days before the day of atonement is beyond comprehension,” said Crown Heights business owner and longtime congregant Yaakov Spritzer*, 63. 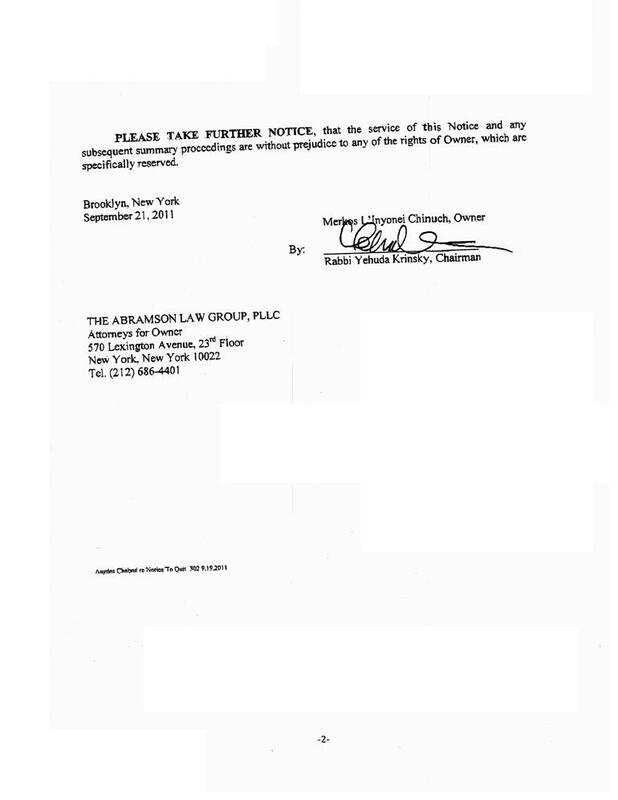 Krinsky, essentially the de facto owner of the massive synagogue at 770 Eastern Parkway, has been feuding with its board of governors for years. The board, called the Gabboim, believe Krinsky’s late mentor, Grand Rebbe Menachem Schneerson, is the Messiah, and it has blocked Krinsky from putting up a plaque in Schneerson’s memory because they don’t consider him dead. They’ve also blocked Krinsky — who was Scheerson’s aide until his death in 1994 and named the sole executor of his will — from speaking at the synagogue. Krinsky has countered by trying to boot the board in an apparent bid to seize more control for himself and the other rabbi Schneerson left in a position of power, Avraham Shemtov. An earlier attempt to toss the board from the building was dismissed on technical grounds by a state appeals court this past March. Eli Cohen, 56, the executive director of the Jewish Community Council, said Krinsky should have taken his case to a Jewish tribunal known as the Beth Din. “The secular court is not the place to litigate issues of religion,” Cohen said. 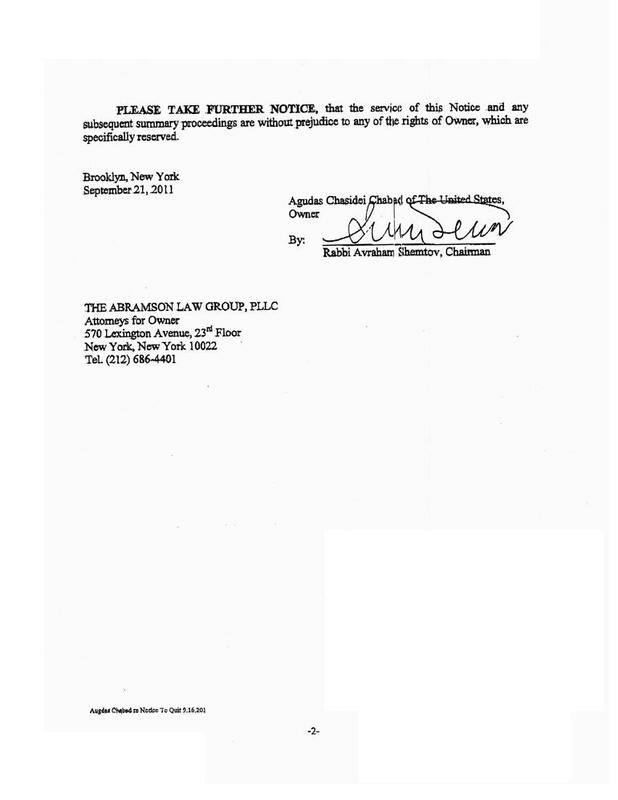 Krinsky’s lawyer and spokesman declined comment on the dispute. Yaakov Spritzer: The Ganev and Mosser Yaakov Spritzer. The same Yaakov Spritzer who introduced the court system to Crown Heights. On May 6, 1997, the plaintiffs, a not-for-profit Corporation and Yaakov Spritzer, filed a complaint against seven named defendants consisting of 167 paragraphs extending over 50 pages and asserting eleven claims as follows: I) RICO, pursuant to 18 U.S.C. 1962(b); II) RICO, pursuant to 18 U.S.C. § 1962(d); III) RICO, pursuant to 18 U.S.C. § 1962(c); IV) RICO, pursuant to 18 U.S.C. § 1962(d); V) Tortuous Interference with Contractual Relations; VI) Fraud; VII) Conversion; VIII) Unfair Competition; IX) Breach of Fiduciary Duty; X) Assault; XI) Intentional damages to property. To characterize the complaint as prolix, replete with hearsay and irrelevancies, would be charitable. Plaintiff Spritzer was then called as a witness. Most revealing, if not disturbing, was the testimony elicited from Spritzer upon cross- examination,…. A careful examination of the returns for the years 1996-1998 give rise to questions to which answers that were less than satisfactory were offered by Spritzer. As has already been indicated, the proceeding was stayed from the conclusion of the testimony on October 31st, 2001, until May 13th, 2002, when the stay required by the filing of the bankruptcy petition was lifted and the direct testimony of Spritzer was resumed. On Schedule D, Spritzer is listed as a secured creditor in the amount of $1,131,675, which is $131,675 in excess of the mortgage he holds for one million dollars and he surmised that the excess must be an unsecured loan. One can’t help but conclude upon reading his testimony about the schedules submitted to the Bankruptcy Court that the information they contain is of questionable accuracy and the record of monies received and monies disbursed represent a haphazard hodgepodge of speculation. The conclusion that is compelled by his testimony is that the affairs of the Corporation were conducted by Spritzer as though it was his personal fiefdom with occasional allusions to board approval at meetings which are nowhere documented and by resolutions which were adopted and action taken only because Spritzer divines that they were. The vigorous assertion by Spritzer that Goldman, Heber and Mendel breached a fiduciary duty they owed Machne Menachem by a fleeting involvement in Ohr Menachem upon which they embarked to provide a summer camp experience for some children of Crown Heights who would not otherwise have had it pales into insignificance when compared with the total disregard for the obligation of a director with which this record of self-dealing and financial legerdemain reeks. Throughout his testimony, Spritzer asserted that meetings were held by him and Schreiber or by him, Schreiber and Spalter, at which corporate action was approved and yet neither Schreiber nor Spalter were called by him in support of those assertions. The summary of the testimony as discussed above would be correctly interpreted by the reader as conveying an unequivocal skepticism of Spritzer’s testimony regarding prior approval and authorization of his virtually unilateral action on behalf of the camp and the Corporation. I have previously alluded to the comparative breaches of fiduciary duty by Spritzer which, at the very least, makes his airing of them noisome. The evidence established convincingly for this Court that what is alleged to be their abandonment was, instead, what I have analogized to be their constructive eviction by Spritzer. The foregoing findings of fact drive the Court to conclude that Joseph Goldman, Mendel Hershkop and Shmuel Heber are still, as a matter of law, directors of Machne Menachem, Inc. The foregoing constitutes the Court’s findings of fact and conclusions of law. The Court has considered the arguments advanced in the brief of the plaintiff Corporation which requires no discussion by the Court in addition to what has been written and which, the Court, in any event, finds unpersuasive. Everyone knows Yankle the Ganev Spritzer! If you were to walk the streets of Crown Height and ask people, who is Berel the Ganev? they will ask you back, Nu, who is Berel the ganev? If you were to walk the streets of Crown Height and ask people, who is Yossel the Ganev? they will ask you back, Nu, who is Yossel the Ganev? There is only one name that (when heard) people will not ask you, Nu, who is he? and that is… YANKLE THE GANEV. Everybody knows who Yankle the Ganev is (no explaining needed). Yankle the Ganev was also the first, shall we say “the god father” to make a vicious Meisra against fellow Jews, just so he can swindle property and money from them. The sick dog Yaakov Spritzer has his only sister, his flesh and blood arrested…. I can’t even continue writing… I mean what can I add…see for yourselves.